To help brewers and winemakers formulate their fruit beers and country wines, here’s a table listing the percentage of water, sugar and acid found in many common fruits. The types of acids in the fruit are also listed. You’ve probably noticed that most wine is made from grapes. If you go to the liquor store, you may be able to find a few wines made from other fruits (so-called country wines), but these are a small minority. 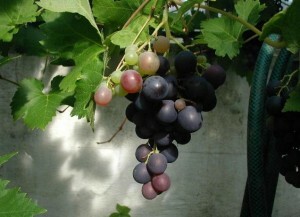 The vast majority of wines are made from grapes. And not just any grapes — most wines are made from grapes of the species Vitis vinifera. With summer here and many fruit harvests to come, some homebrewers may be wondering if they can make homemade wine from the bounty of their local orchards or gardens. You can, but before trying to make wine from fruit, it pays to understand why most wine is made from grapes. In a nutshell, grapes contain the right balance of sugars, acids and tannins to make a fermented beverage that will keep and also taste good. On their own, most other fruits do not. However, you can add sugar, acid or tannins to balance the juice from any fruit and ferment it into a delicious fruit wine. Over the summer, I’ll explain how to make fruit wine from a few of the more popular fruits. But first, let’s take a look at grapes and what makes them the fruit of choice for most winemakers. A modern premium wine kit, containing a bag of slightly concentrated grape juice (in the box) and all the additives in individual containers. This kit also contains grape skins which the winemaker soaks (macerates, in winemaking lingo) during the fermentation. Imagine going to your favorite wine shop and paying $20 for your treasured British Columbia Meritage. You pour the wine and take in its aromas of vanilla, chocolate, and leather. You swirl the wine over your tongue and detect flavors of plum and black currants. Now, what if you could make that same wine for $5 a bottle? Why Make Wine From Wine Kits? 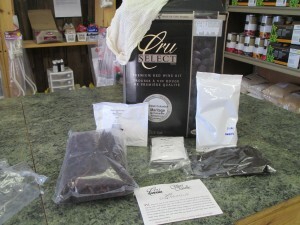 There are several reasons why to make wine from wine kits. One reason is that you love wine and want a cellar with a nice selection of wine without breaking the bank. The equipment needed to make wine from a kit runs in the $100 to $200 range. And if you’re a homebrewer, you probably have most of it anyway. From there, you can always purchase more carboys to increase your capacity to make more wine to meet demand. Kits themselves vary from “budget” kits, starting at around $60, to premium kits that cost up to around $200. A kit makes 6 gallons (23 L) and yields 30 bottles of wine, so your wine will actually cost around $3 to $7, depending.